Chinese President Xi Jinping delivered a keynote speech on "seeking common and sustainable development and being cooperative with win-win partnership" at the UN Sustainable Development Summit in the United Nations headquarters in New York on Sept. 26. 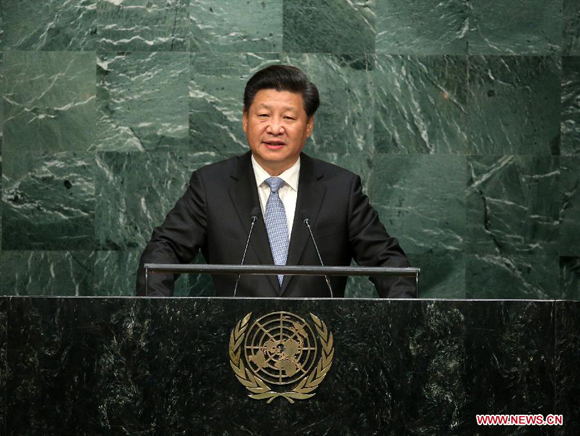 It was Xi Jinping's first speech delivered in the UN headquarters ever since he served as Chinese president, so it has drawn world-wide attention. The People's Daily has summed up a series of key words to help people have a better understanding of the main idea of President Xi's speech. The United Nations established the Millennium Development Goals 15 years ago in the hope of helping hundreds of millions of people live a better life, Xi said in his speech. "We experienced sustained global economic growth as well as the international financial crises," said President Xi, adding "we witnessed the rise of developing countries and faced the reality of imbalanced development between the North and the South." Xi stressed that while 1.1 billion people have shaken off poverty, more than 800 million people are still in starvation. President Xi briefed the audience on the role and contributions of China in implementing the Millennium Development Goals over the past 15 years. He said that China has lifted 439 million people out of poverty and made remarkable progress in areas of education, health and women's welfare over the past 30-plus years since the country embarked on reform and opening-up. Xi pointed out that peace and development are still two major themes of the present era. To cope with global challenges including the recent refugee crisis in Europe, the fundamental way out is to seek peace and achieve development, he said. In the face of many challenges and difficulties, the world must focus on the key issue – the development, he said, stressing that only development can eliminate the root cause of conflicts, protect the basic rights of the people, and meet the people's yearning for a better life. Xi said that the post-2015 development agenda provides new visions for global development and new opportunities for international development cooperation. "It is a high-standard task list as well as a heavy letter of commitment," he said. He stressed that the international community should strengthen cooperation and jointly implement the post-2015 development agenda to achieve win-win cooperation. He also said that China has solemnly committed itself to implementing the post-2015 development agenda responsibly and will continuously promote global development through solidarity and cooperation." - Fair development so that development opportunities will be more equal. - Open development so that the achievements of development can benefit all parties. - Comprehensive development so that the foundation of development can be more solid. - Innovative development so that development potential can be fully released. Xi put forward a four-point proposal for the international community: building up the development capacities; improving the international environment for development; updating the partnership for development; and strengthening the coordination mechanisms for development. Xi called for enhancing the development capabilities, saying different countries should make different development strategies according to their own national situations. He called on all countries to work together to maintain international peace for the sake of development. Meanwhile, international financial institutions should step up governance reform, and multilateral development agencies should increase their supply of development resources, he said. In addition, Xi said, countries need to step up their macroeconomic policy coordination to avoid, as much as possible, negative spillover effects, and regional organizations should accelerate their integration process and build their overall competitiveness by mutually complementing intra-regional advantages. The United Nations should continue to play a leading role. Over the past 60-plus years, China has provided 166 countries and international organizations with nearly 400 billion yuan (about US$63 billion) worth of assistance, and dispatched over 600,000 aid workers, over 700 of whom have laid down their lives in helping the development of other countries, President Xi said. He said China will set up a fund, with an initial contribution of US$2 billion, to support South-South cooperation and assist developing countries in implementing their post-2015 development agenda. Xi said China will also do its best to raise its investment in the least developed countries (LDCs) to US$12 billion by 2030. In addition, China will exempt the debt of the outstanding intergovernmental interest-free loans due by the end of 2015 owed by relevant LDCs, landlocked developing countries and small island developing countries, the president said. Xi also announced that China will establish an international development knowledge center to facilitate studies and exchange regarding theories and practices of development suited to each country’s respective national conditions, and will propose discussions on establishing a global energy network to facilitate efforts to meet the global power demand with clean and green alternatives. The People's Daily sums up a series of key words to help the people have a better understanding of the main idea of President Xi Jinping's keynote speech delivered at the UN Sustainable Development Summit.